I'm having a much better day today in the stamp room! Yippee! How's your day going? I've had a busy day so far and much more to accomplish. I had hope to have posted by now, but I'm running late. Better late that never I guess. After the day I had yesterday, I'm sticking with the simple theme. Although I am working on a project and I hope to have a tutorial to share in the next few days. Fingers crossed. Sale-A-Bration promotion beginning January 22. I'm in love with the products that you can earn in this promotion (I really like this Designer Series Paper!!!) and I think you'll be happy too! Let me know what you think of the products I've shared and thanks for stopping by! Click here to place a Stampin' Up! order. That is such a pretty card! Thanks for sharing it. Vanessa! 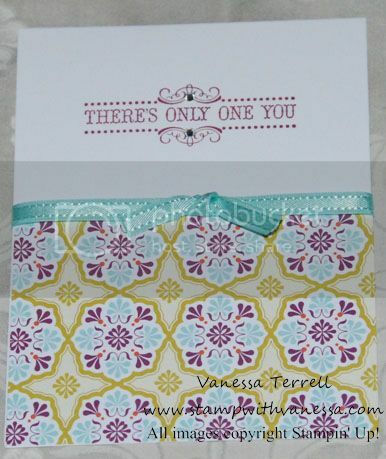 This a beautiful site you have here:-)This card is gorgeous and I love of you designed it! Happy New Year! I've never stamped, but I always appreciate receiving beautiful handmade cards from friends who do!